America's favorite Avon bath oil is Skin So Soft. Go ahead and pamper yourself with this jojoba infused luxury bath oil. Customers love this uplifting botanical and herbal scent oil. Use this moisturizing bath oil during your bath and shower for soft and smooth skin. 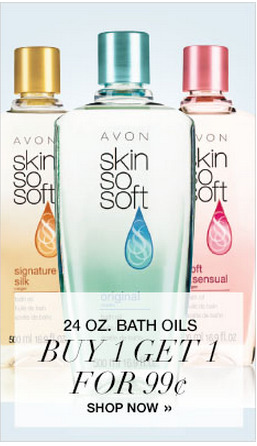 Check the current Cheap Avon Skin So Soft Bath Oil deal by clicking on the links below. These bottles are the large 25 oz size.